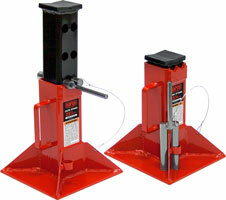 ﻿ Jack Stand, China Jack Stand, Fork Lift Support Stands for Lifting. Height intervals 3 x 2" 3 x 3"
Base size 9" x 9" 10" x 10"
Saddle size 3" x 4.5" 2.25" x3.25"
• Fleet and maintenance garages where low profile stands are used to support forklifts, loaded trailers and heavy machinery. • Pin type support column adjusts to four different height positions. • Heavy duty adjustment pin is secured to stand to prevent loss. • Handle provides ease of positioning and carrying. • 9" / 10" square base secures and stabilizes load. • Fleet and maintenance garages where low profile stands are used to support trucks and loaded trailers. • 10" square base secures and stabilizes load. Min. height 10.5" 18.5" 28"
Max. height 17" 30" 47"
Height intervals 4 x 1.5" 7 x 1.5" 10 x 2"
Base size 12.5" x 12.5" 17 x 17" 16" x 16"
Saddle size 3" x 5" 3" x 5" 3" x 5"
• Fleet garages, agricultural and construction maintenance shops where a pin type height adjustment column is desired. • Pin type support column adjusts to multiple height positions. • Adjustment pin is secured to stand to prevent loss. • Four legged base made of heavy schedule 2" diameter pipe for added stability. • Large support saddle with locating lugs position and center load.